“Do you think we can get through Mum”? I turn back to look at Harry, holding one of my shoes in each of his hands and an excited look on his face. I am wading across the road, in calf deep water. “Maybe!” I reply. I get to the other side and see the steep incline out of the creek crossing and the big, slippery rocks. Not going to happen. We are in a 2 wheel drive car with low clearance and if we try and drive through I am pretty sure we will not get out the other side. There is no mobile reception and we have not seen a single car along this road all morning. I am adventurous, but this would just be plain stupid. I am so disappointed. 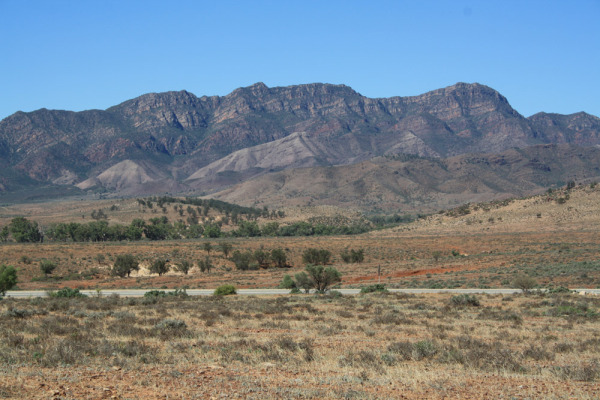 This was one of the highlights of the Flinders Ranges I had been looking forward to the most. I woke up excited. 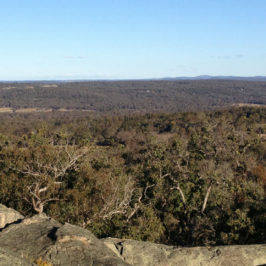 My plan for today was to drive out to Brachina Gorge, probably one of the most important geological sites in Australia. I had checked with the information desk at Wilpena yesterday to see if the road is open after the heavy rains a week ago. I was told the Buneryoo Valley road is closed but the road off the Blinman road is open. They confirm that although the road is unsealed and a bit rough in some spots it is fine for 2 wheel drive cars. Ever since reading a book called “Rock Star” about the late Reg Sprigg I have wanted to visit the Flinders Ranges. Sprigg was a phenomenal geologist and a man of many firsts, including being one of the first people to theorise climate change. He worked in the same circles as Douglas Mawson, and while Mawson made it to the South Pole, Sprigg achieved many things just as, if not more important. He discovered the fossils of the first ever soft bodied life forms on the planet. Sadly many of his peers back in the day did not believe what he had discovered was possible. It was only after his death in 1994 that the 540 million year old Ediacaran fossils were deemed to be the real deal and a new era was added to the worlds geological timeline – the Edicaran era (630 to 542 million years ago) now slots in before Pre-cambrian life. 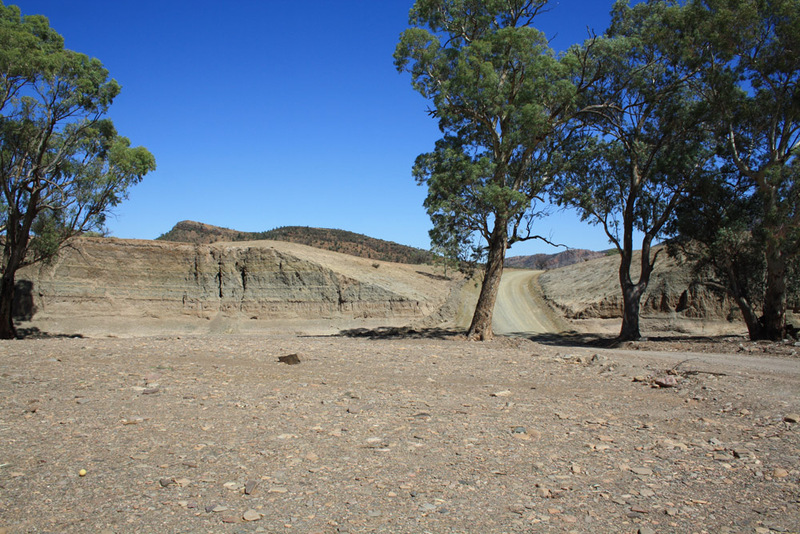 Brachina Gorge not only has these edicaran fossils visible for viewing, the whole road has been turned into a geological trail. 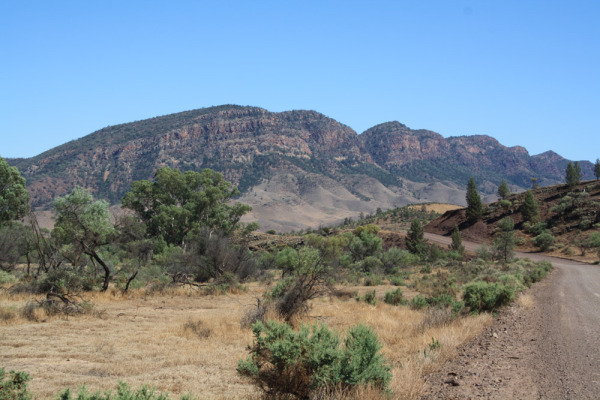 The age of the Flinders Ranges along with the geological processes which have taken place over 650 million years have essentially created a time capsule allowing geologists and just general travellers like me to get a glimpse of how the planet has been formed. It is one of the most complete sedimentary records anywhere in the world. And now my geological time travelling journey has come to an abrupt halt about halfway into the 20 km trail. We have had a fantastic morning, taking it slow and stopping off at each of the geological points of interest along the drive. 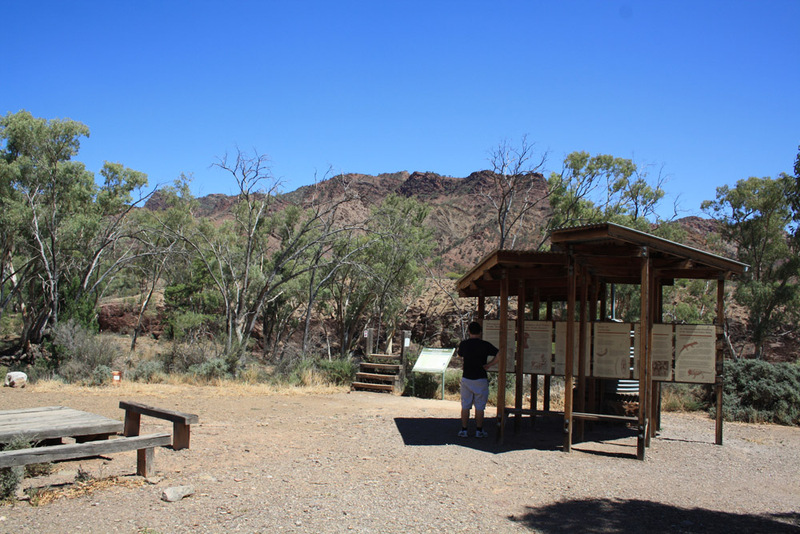 Here at the creek crossing of the supposedly 2 wheel drive friendly road we are probably only a few kilometres from Brachina Gorge itself. So close and yet, with this creek, so far. 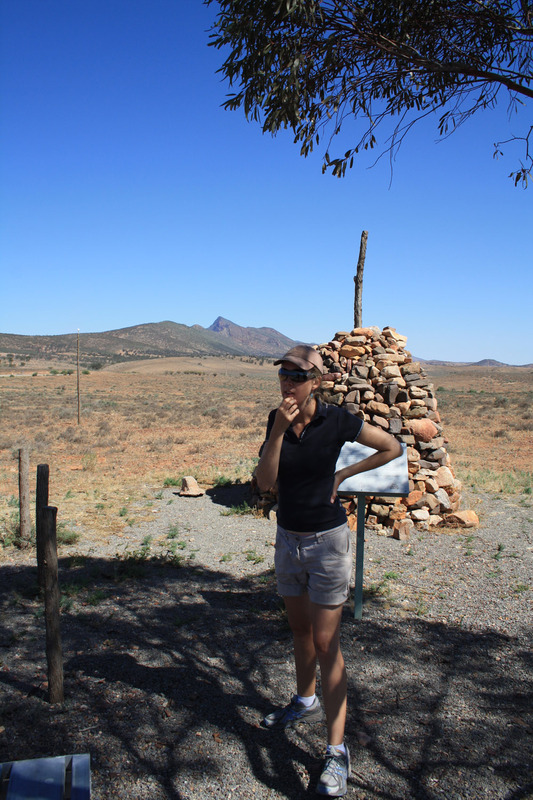 I contemplate walking the last few kilometres in, but it is getting hot now and I don’t have enough drinking water to sustain 3 people on a 10 km return walk. 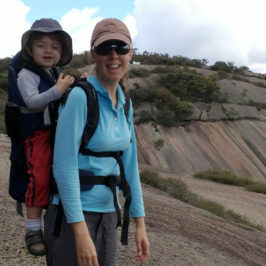 Stopping to have a walk around at one of the geological points along the Brachina Gorge geological trail. Chris sees my disappointment. “What now?” he asks. “Let’s go up to Blinman have some lunch and have a think” I reply. Harry hears this, looks at me as I’m wading out of the creek and launches into a tantrum that only a 3 year old can perform “Noooooooo! I don’t want to go back! 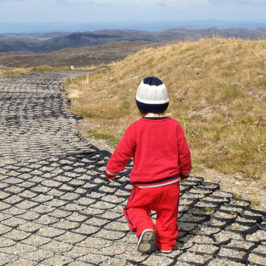 I want to keep going!” I have to admit, I find it strangely therapeutic watching my son scream and cry with frustration at the situation as internally I am doing the same. Ironically I find out later on the name Brachina comes from the Aboriginal word ‘Vachina” which means cranky. It refers to a dreamtime legend about birds having an argument over a grindstone. I can’t comment on the grindstone, but I am certainly feeling cranky I can’t reach the gorge. We drive back out onto the Blinman Road and by the time we arrive in Blinman the scenery has washed most of my frustration away. 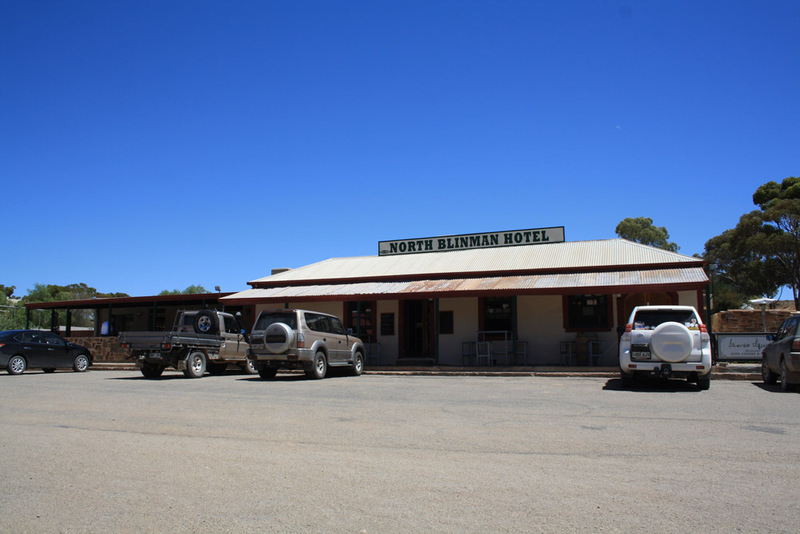 A glass of Peter Lehman Riesling and my delicious toasted sandwich at the North Blinman Hotel take care of the rest. Sitting an elevation of 610m above sea level, Blinman wears the badge of being the highest town in South Australia. It was settled in 1859 after the discovery of copper, and had between 1500 – 2000 people living here during its mining days. Now its population is 22. 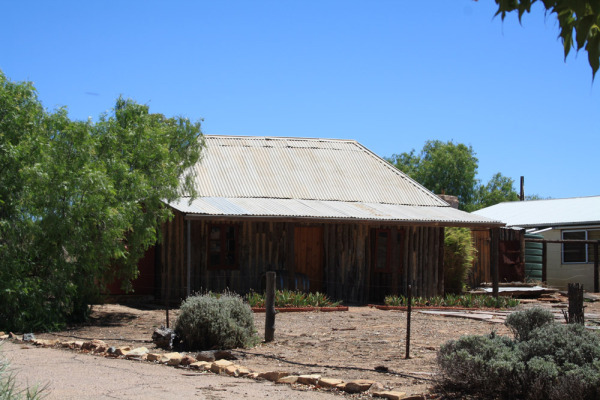 Its mining history can still be seen in the mine tours operating in one of the old mines across the road from the North Blinman Hotel and in old pine miners cottages still standing around the town. I take a walk around the town while Chris and Harry relax on the verandah of the hotel chatting to a man from Adelaide. He comes up to the Flinders Ranges once a year and camps at Rawnsley Park to get away from the hustle and bustle of the city. Its interesting how many people we have run into over the past few days who make a yearly pilgrimage to the Flinders to de-stress. I get back from my walk and the man chatting to Chis and Harry says he has come through Brachina Gorge this morning in his four wheel drive and would be happy to take us out there in his car. It is a very generous offer but I can see the heat and the driving is starting to get to Harry and I dont feel like subjecting this kindly stranger to a tired and canterkerous 3 year old all afternoon. 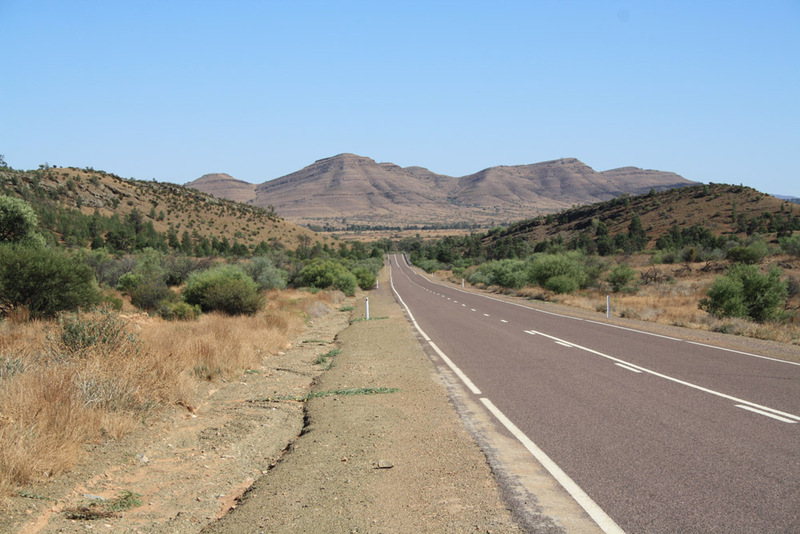 He suggests that we should be able to get to Brachina in our car from the other side, if we take the road from Blinman to Parachilna and then drive in from the west. I am refreshed after lunch and decide we will give it a go. 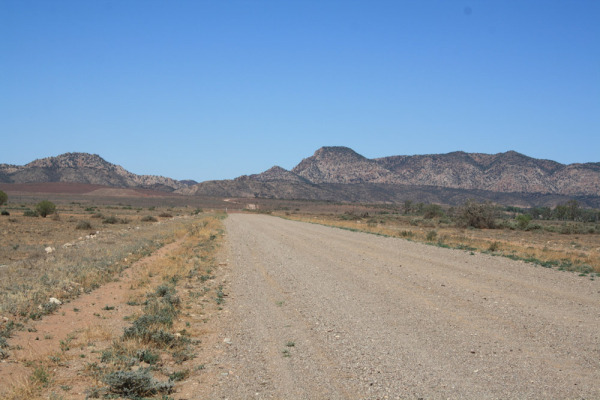 We leave Blinman and head west along the Parachilna Blinman Road. It follows ancient creek beds that have carved out this hauntingly beautiful landscape. Big river red gums and jagged mountain tops loom beside us. Harry has fallen asleep so we only stop briefly at Parachilna Gorge. 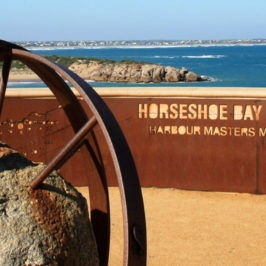 There is information about the Heysen trail, a 1200 km walk that starts here and finishes at Cape Jervis on the Fleurieu Peninsular. Now there is a hike I would love to tackle one day.The creek is dry at the moment and with the hot wind blowing and 34 degree temperature outside it feels a bit desolate. We continue driving and hit the sealed road heading south to Hawker. A bit further south and we come to the turn off to get into Brachina Gorge from the western side. The road is a mess. It is the most corrugated road I have ever been on (and I have been on some bad roads). We are barely driving at 10 kms an hour and after 10 minutes of our teeth rattling away in our heads Harry starts to cry. I can’t blame him, This road is painful and I am actually worried about damaging the car. We persevere for another 5 minutes and when it doesn’t improve we decide that is enough for the day. 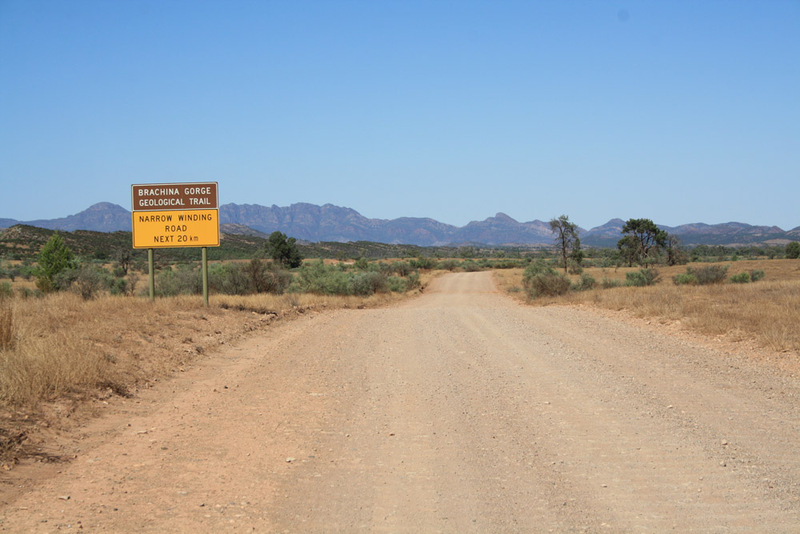 After attempting to get into Brachina Gorge from both sides it is clear the road is beyond the capabilities of our 2 wheel drive sedan. Strangely I am not too upset. I just figure that it gives me more reason to come back here one day, next time with a four wheel drive. The relief is palpable as the car turns back onto bitumen. With no damage to the car or our teeth, we set off back to Rawnsley Park Station. 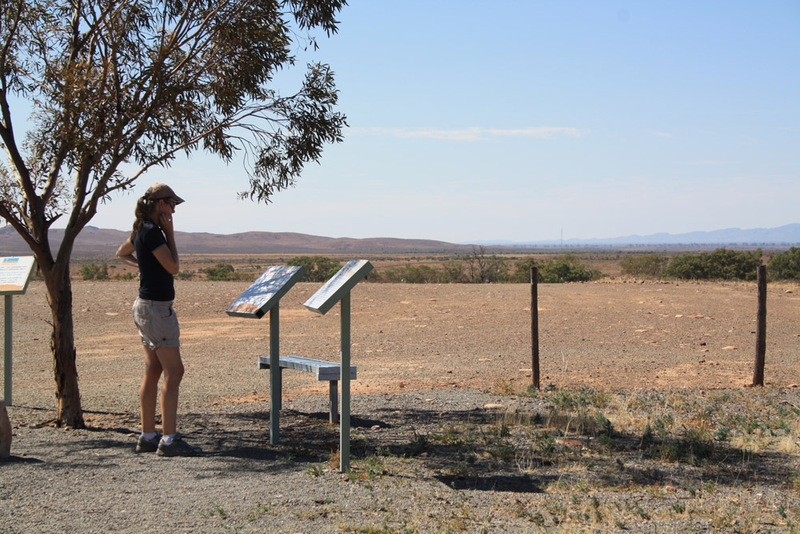 A viewing point just past the Moralana Scenic drive turnoff features a memorial to the surveyor William Grieg Evans. This replica stone cairn was used by the surveyors back in the day, and interpretative signage provides information about about the Overland telegraph line, nearby mountain ranges and Australia’s second largest lake, Lake Torrens to our west. Our drive back is filled with conversation about how beautiful but unforgiving this country is. 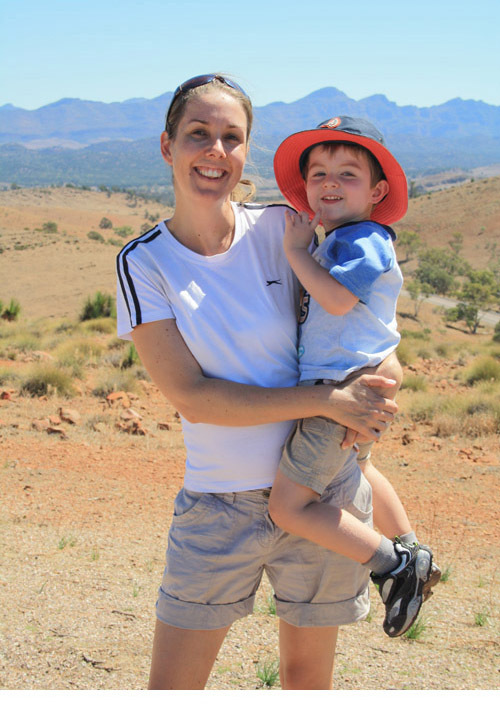 We have thoroughly enjoyed our time here in the Flinders Ranges. Our last evening at Rawnsley is spent watching the sunset, eating dinner, having a few glasses wine and watching the stars come out. 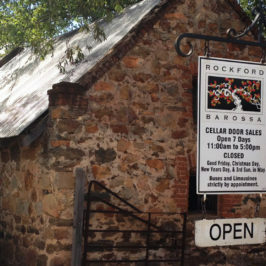 Tomorrow we head south to the Barossa Valley. from the Bunyeroo Valley road from the south and the Leigh Creek Rd from the west. 509 km (6 hrs) from Adelaide. 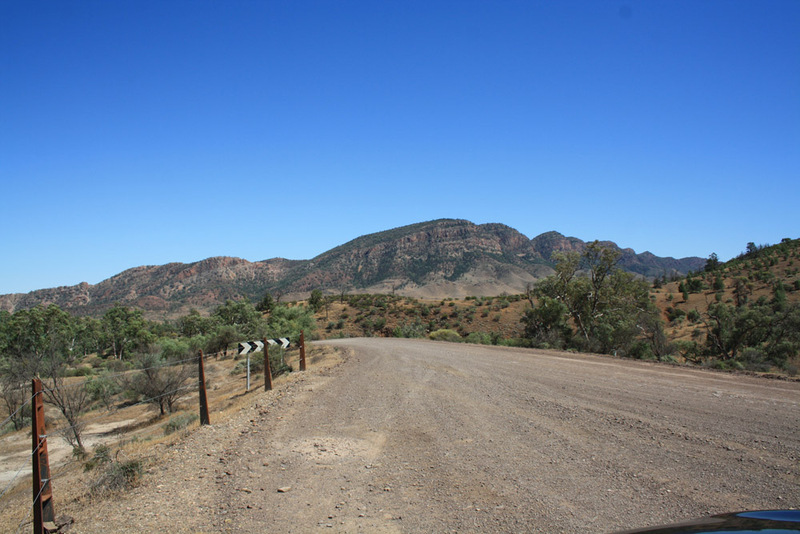 About half way along the Blinman – Parachilna Road. Glad you liked the post Jane. Yes it was a bit disappointing but still a great day. I am definitely going back to the a flinders Ranges again one day such a wonderful place. Glad I could invoke a sense of what the landscape was like for you. Yes it’s dusty and some days were hot but the sense of peace I felt out there was so refreshing. It sounds like you can appreciate this. Where did you grow up? Ah, you’ve inspired me to pick up a trip I planned a few years ago, but had to give away due to lack of water in the area. 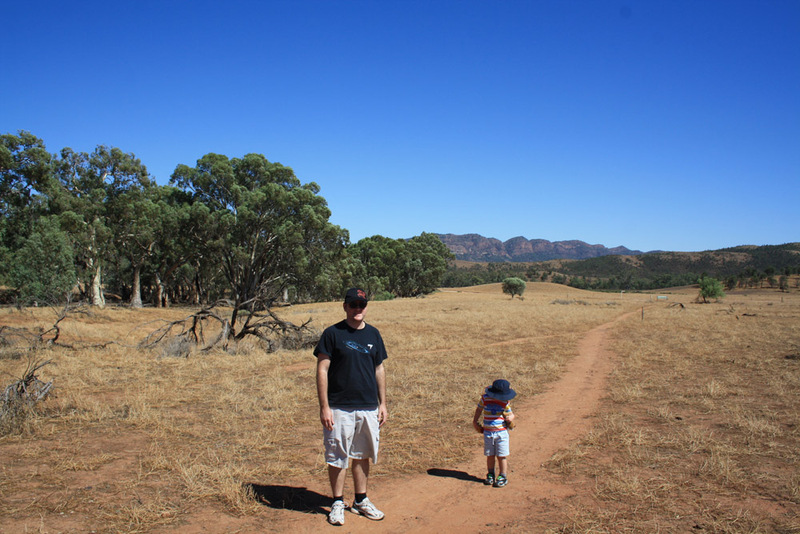 It was walking from Parachilna to Wilpena Pound along the ridges (ie. Not down on the Heysen). When I as told there was a dead goat in Dead Goat Soak, that was the end of it! Glad you enjoyed my tale and that I’ve inspired you to have another crack at the walk you had planned. 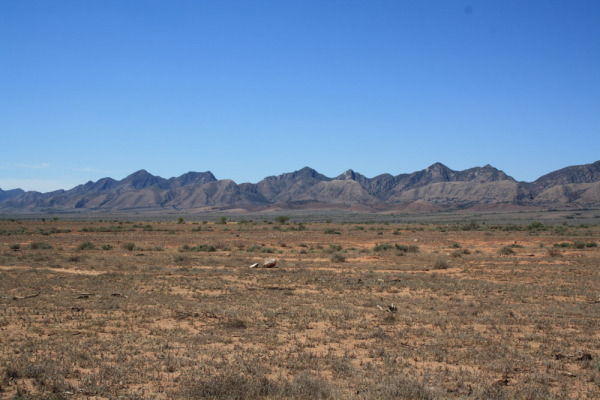 It is such amazing country out there but I have to say I am a bit daunted by the idea of a big hike out there, pretty much for the reason you mentioned. Water. Poor goat! We went at the end of February and the week before they had a big downpour out there. But there was still no water in the creek at Parachilna Gorge. I think I was guzzling about 4 liters of water a day while we were in the Flinders Ranges, the moisture just gets sucked straight out of you. 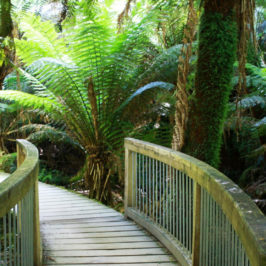 If you go through with the hike please write about it, would love to read about it!